The front cover of the Halo 2 Limited Collector's Edition. The Halo 2 Limited Collector's Edition is the limited edition release of Halo 2. The Limited Collector's Edition was released alongside the standard edition on November 11, 2004. 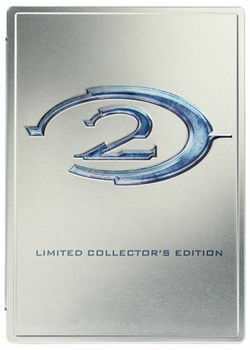 The Limited Collector's Edition Disc provides documentaries on the development of Halo 2 and the Halo universe as a whole. It also provides access to deleted scenes and other content from the cutting room floor. On the main menu of the DVD where it shows behind the scenes, art gallery, etc, do not do anything. Just simply wait. Soon, you can hear a voice of a soldier begging you to press play. On any section of the DVD(NOT watching the movie, just the sections), press and hold the left button on your DVD remote. It should cycle quickly through the selections of the section and soon, it will send you into a secret art gallery. Each section gives a different gallery. The Limited Collector's Edition provides an exclusive game manual, which features a Covenant Elite Zealot on the manual's cover instead of the standard edition's Master Chief cover. The manual is written as if it were a report made by the Covenant Supreme Commander of the Fleet of Particular Justice to the Prophet of Truth, after the Battle of Installation 04. The Conversations from the Universe is a booklet containing various conversations, letters and text logs from characters in the Halo universe. The back cover of the Halo 2 Limited Collector's Edition. The contents of the Halo 2 Limited Collector's Edition. The Halo 2 Limited Collector's Edition Manual. A warning shown before the menu of the Halo 2 Limited Collector's Edition DVD. "Super old 100 poly" soldiers from an early version of Halo, seen in "Halo Origins". The title shot of "Behind the Scenes: Making of Halo 2". The menu of the Halo 2 Limited Collector's Edition DVD.